Waiting on Wednesday is a weekly event hosted by Breaking the Spine where we readers salivate over the books we wish were on our bookshelves yesterday. In this sequel to Mechanical Failure, Captain Rogers, despite his best attempts to do otherwise, has become the acting admiral of the 331st Meridan fleet. His first task: worrying. A lot. 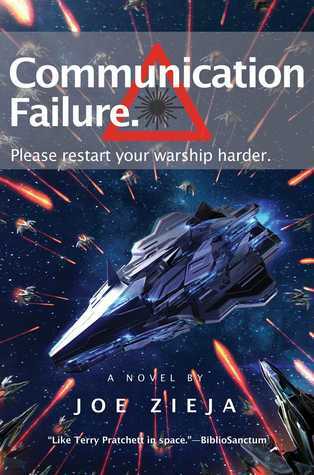 The rival Thelicosan fleet, under the influence of bad intelligence, a forbidden romance, and a communication officer with an eardrum injury, is about to break a two-hundred-year-old nonaggression pact. They have offered a vague, easily misinterpreted message: “We’re invading.” Rogers isn’t sure, but he thinks that’s probably bad. War is hell, especially when you’ve forgotten how to fight one. Why am I so excited for this book? Mostly because I want more hilarious droids back in my life. Also, did you actually read that overview quoted above? How can you not be excited about a book that includes (but no doubt is not limited to) “bad intelligence, a forbidden romance, and a communication officer with an eardrum injury”? I’m hoping that forbidden romance includes a certain character who I adored from the first book, Mechanical Failure. I also wouldn’t mind if the entire book was just focused on Deet. Don’t get me wrong, Captain Rogers (or should I say, Admiral Rogers?) is one hilarious character in his own right. But he can’t replace my love for Deet. Mechanical Failure got me hooked with a fantastic cast of characters, enough laughter that I counted reading that book as my ab workout for the week and with such an ending that I was left desperate for more. I’m still desperate, as the book doesn’t come out for a couple more months, but we are ever closer to returning to such a hilarious and fantastic universe that I wish I never had to leave. So bring on the antics of Communication Failure. I’m most certainly ready for them.